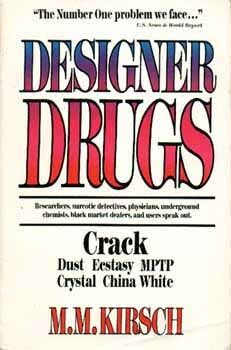 "Designer drugs"-manmade synthetics that mimic the effects of the classic street drugs, but can be 1,000 times stronger - are being cooked up by unscrupulous chemists across the country. ...clandestine labs are being set up in a few days' time. First time I did China White I thought it was cocaine. I snorted it, got the sweats and vomited. Did it later on. Then I went to prison...a long story. In prison you take anything you can get. We got one dealer selling a kit with 10 balloons (synthetic heroin) and a bindle of cocaine for an antidote! That way they die just wired to the gills. There's a Demerol look alike called MPPP, which was uncontrolled and could be sold on the streets without any fear of prosecution. . . . We began seeing young addicts literally frozen overnite. . . . They looked 70 or 80 years old with Parkinson's disease.